If it hasn’t become clear to most of you by now, it should have. We are in the middle of a blatant attempt by certain political elements to completely and utterly overhaul society as it has existed for at least the last 100 years, if not longer. I call these elements by what they call themselves – Republicans. A little history is in order. Republicans are so transparent, so self-centered, so clueless, yet so stupid, that everything they do in Washington is getting to be…so tiresome. Now we have another minor administrative, bureaucratic glitch in one agency of Washington, and the dumb R’s are flogging it like they flog all the other dead horses they dig up, in the hopes that unlike all the other scandals that come and go, these will be remembered in the elections of November, 2014. It turns out the election of Obama in 2008 ignited a flurry of so-called patriotism. We elected a black man to the White House. Since I began this blog back in 2007, not a month has gone by where I have not written at least one post. So, this being January 31st, and having not written anything this month, I decided I’m not going to purposely ruin that record. It’s a meaningless record, but if it spurs me to write something, then so be it. I’ll write something. I wrote this on the day after Christmas. (previously believed to be Clement Clarke Moore). The leftovers were eaten, the fire was well doused. While the pols at the Capitol dreamed of bribes of great cost. Here’s the moment you’ve been waiting for. Both of you. Who will SI endorse for President of the United States? I’m sure that if you’re a regular reader, you really have no idea, because I’m so obviously impartial in my politics, and I clearly lean in both directions depending on the issue, that you are all scratching your heads, trying to tease some sense of who I will ultimately pick. Let me ease the suspense, and give it to you straight. For my 500th post (yes, an auspicious post it is!) I’m going to reprint a piece of ignorance and vitriol I was involved with on Facebook, with the follow up comment I made. Some people seem to go out of their way to find fault with Obama, and his favored policies. They really have latched onto Obamacare with a certain amount of irrationality that bespeaks some un-articulated motivation. I can think of nothing that would cause such nonsense other than pure and simple bigotry. By now most people are aware of the various laws passed by, almost exclusively, Republican controlled state legislatures that ostensibly are supposed to prevent voter fraud at the polls (33 states so far. 180 restrictive voting bills have been introduced in 41 states just since the beginning of 2011.) 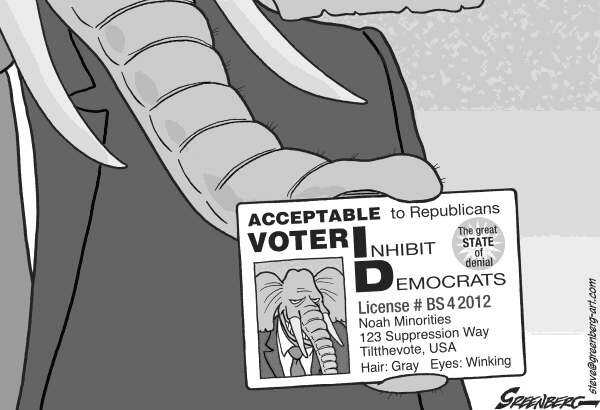 They attempt to accomplish this by requiring photo IDs that are mandated to be produced before someone votes. On its face, it seems logically innocuous. We all have photo IDs (driver’s licenses, etc) that show who we are, don’t we? What’s the big deal? We need to produce an ID when we cash a check, or obtain credit, or get on an airplane, the argument goes, so why not when we show up to vote? Besides there are all those unscrupulous people out there committing voter fraud, impersonating someone else in order to vote more than once, right? If you’re like me, you have a hard time ingesting current news, especially on the political front. The polarization of America is, front and center, the most perplexing aspect of current political discourse. Take for instance this fixation on defeating Obama, making him a “one term President” as Mitch McConnell promised early in his administration, during a time of economic crisis when millions of people were losing their homes, their jobs, and their way of life, and Congress should have been working WITH the President, not against him. Some of you may remember the TV prime time soap drama, Dallas. JR Ewing and his family were Texas oil millionaires with dysfunctional relations rarely seen in real life. One of the plot lines for a whole season occurred after one of the actors (Patrick Duffy, who played Bobby Ewing) left the show, and was not part of the TV family. At the end of the season, he must have missed his paycheck, and asked to be brought back, so the next season began with Bobby’s wife waking from a dream (and he in the shower) with this dream being the entire past season without him. All the viewers smacked their foreheads and thought “WTF?”, but then the show continued with him for a number of seasons, so it apparently didn’t affect the false reality created by the show. Now, don’t respond to this by pointing out leftist hypocrisy. I know that a little human hypocrisy is inevitable. I’m even sure that you could run through 480 or so posts I have here on my blog, and find some minor instance where I exhibit hypocritical tendencies (though I feel confident there is nothing major).